The 4th National Training Providers Forum on the theme ‘Surging Ahead towards Relevance and Quality’ was held for two days on 21st & 22nd April, 2016 at NRDCL conference hall. The opening ceremony was graced by the Hon’ble Lyonpo, Ngeema Sangay Tshempo, MoLHR with the launching of Technical and Vocational Education and Training Quality Assurance Management Information System (TVET-QAMIS) which mainly focuses on providing an online services to TVET Providers, Trainers, Assessors and disseminate information related to TVET providers, courses, trainers, assessors. Currently, there are a total of 72 training providers registered with the Ministry, of which 13 are Government, four NGOs, two corporate and 53 are private training providers. The Forum concluded with the awarding of Training Providers Excellence Award. 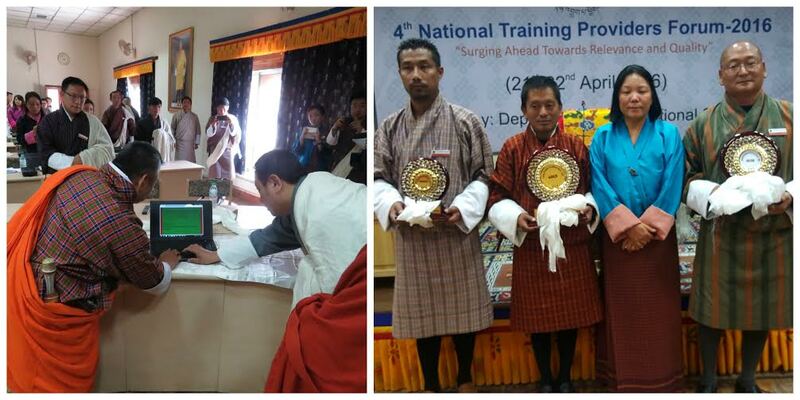 Out of the 35 institutes who have applied for the award, the top three institutes Technical Training Institute-Chumey, Technical Training Institute-Khuruthang & Kunjung Institute of Technology and Innovation won the awards.